At least 1,959 members of the Iraqi security forces were killed across the country in November, the UN says. It is almost three times the figure for October, when the government launched a major offensive to retake the city of Mosul from so-called Islamic State. The number of civilians killed in November was 926, while 930 others were injured. 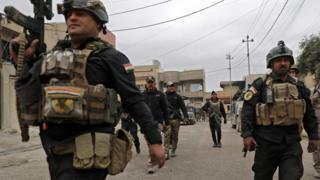 The UN special representative for Iraq, Jan Kubis, said the casualty figures were "staggering". "In its desperate attempt to cling on to territory it controls in Mosul and Nineveh areas, [IS] has been employing the most vicious tactics, using civilians' homes as firing positions as well as abducting and forcibly moving civilians, effectively using them as human shields," he added. Mr Kubis noted that the Iraqi security forces had declared that they were making utmost efforts during the six-week-old Mosul offensive to avoid putting civilians in harm's way, often taking additional casualties as a result. Baghdad province, where IS militants carried out a series of bombings last month, was the worst affected for civilian casualties, with 152 killed and 581 injured. In Nineveh province, where Mosul is located, 332 were killed and 114 injured. 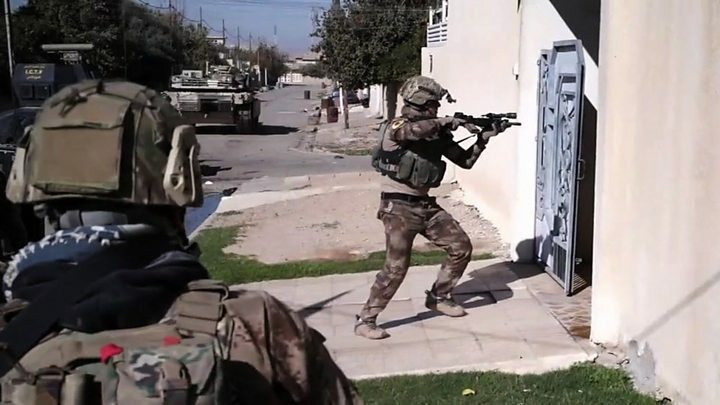 No regional breakdown was provided for casualties among security forces personnel, who include members of the army, police officers engaged in combat, Kurdish Peshmerga fighters, interior ministry troops, and militiamen. The International Committee for the Red Cross (ICRC) meanwhile warned that the offensive to retake Mosul could take months, prompting more and more of the up to 1.5 million civilians believed to be living there to try to flee their homes. Some 77,000 people have been displaced so far, with many staying in their homes as the government suggested. On Wednesday, the UN warned that as many as half a million people in Mosul - including almost half of all the children in the city - had reportedly been cut off from access to clean water after a major water pipeline was damaged in the fighting. The break in the pipeline is located in an area still held by IS, making it impossible to repair quickly. The Iraqi authorities are currently bringing water into recaptured eastern districts by lorry, but the supply is not enough to meet the needs of residents. Unless running water is restored in the next few days, the UN says, civilians will be forced to resort to unsafe water sources, exposing children to the risk of waterborne diseases such as severe diarrhoea and the threat of malnutrition.